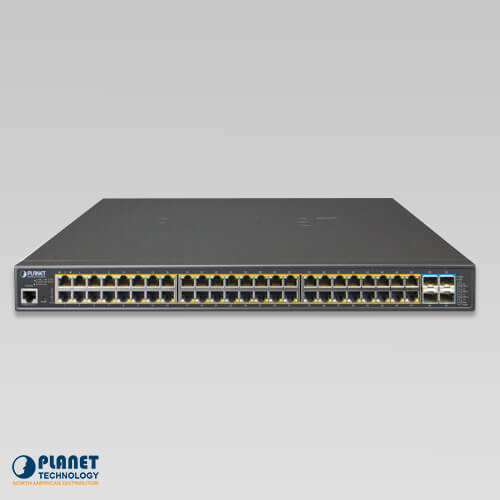 PLANET’s GS-5220-48PL4XR Layer 2+ Managed PoE Switch with redundant power supports both IPv4 and IPv6 protocols, and hardware-based Layer 3 static routing capability. 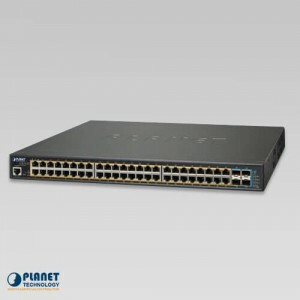 PLANET’s GS-5220-48PL4XR Layer 2+ Managed PoE Switch with redundant power supports both IPv4 and IPv6 protocols, and hardware-based Layer 3 static routing capability. 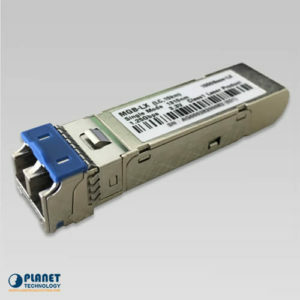 It complies with IEEE 802.3at Power over Ethernet Plus (PoE+), equipped with 48 10/100/1000BASE-T Gigabit Ethernet ports and 4 10G SFP+ uplink slots. 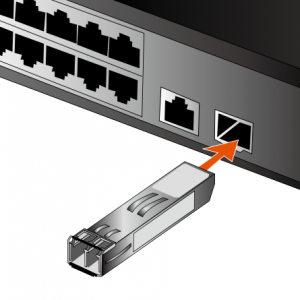 All 48 Gigabit Ethernet ports can be in full operation when integrated with an 802.3at PoE+ injector. The GS-5220-48PL4XR can handle extremely large amounts of data in a secure topology linking to deploying PoE networks, data center/service provider backbones or high capacity servers. It can work with a 10Gbps SFP+ server adapter to help SMBs build the 10Gbps Ethernet network providing 10Gbps NAS (Network Attached Storage) or heavy transmission of a video streaming service. The GS-5220-48PL4XR is particularly equipped with one 100~240V AC power supply unit and one 36~60V DC power supply unit to provide an enhanced reliable and scalable redundant power supply. The continuous power system is specifically designed to fulfill the demands of high-tech facilities requiring the highest power integrity. With the 36~60V DC power supply, the GS-5220-48PL4XR is able to act as a telecom-level device that can be located in the electronic room. PLANET’s newly developed feature, ONVIF Support, is specifically designed for co-operating with video IP surveillances. 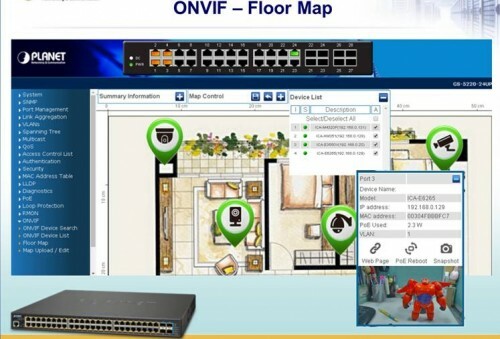 From the GS-5220-48PL4XR GUI, clients can see all of the ONVIF devices via network application in one click. In addition, clients can upload floor images on the switch which allows for easier inspection and planning of deployment locations. Clients can get real-time surveillance information, online/offline status, and also allow PoE reboot control from the GUI. The GS-5220-48PL4XR provides IPv6/IPv4 management and built-in L2/L4 Gigabit Switching engine along with 48 10/100/1000BASE-T ports featuring 36-watts 802.3at PoE+, and 4 10Gbps SFP+ fiber slots. With a total power budget of up to 600W, the switch provides a quick, safe and cost-effective PoE network solution to IP security surveillance for small businesses and enterprises. 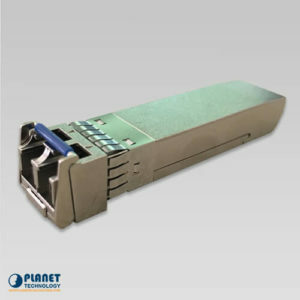 Each SFP+ slot supports dual speed and 10GBASE-SR/LR, meaning the administrator now can flexibly choose the suitable SFP+ transceiver according to the transmission distance or the transmission speed required to extend the network efficiently. 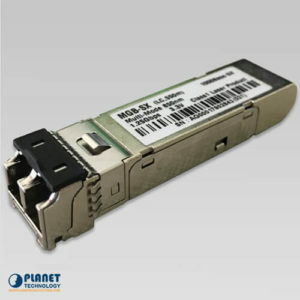 With its 4-port, 10Gbps Ethernet link capability, the GS-5220-48PL4XR provides broad bandwidth and powerful processing capacity. The GS-5220-48PL4XR features IEEE 802.3at PoE+ that combines up to 36 watts of power output and data per port over one Cat5E/6 Ethernet cable. It is designed specifically to meet the demand of higher power consuming network PD (powered device) such as IR, PTZ, speed dome cameras or box-type IP cameras with a built-in fan and heater. Compliant with both 802.3at and 802.3af PoE, it allows for more flexibility of power requirements for a variety of PDs. The GS-5220-48PL4XR can be configured to monitor a connected PD’s status in real time via ping action. Once the PD stops working and has no response, the GS-5220-48PL4XR will resume the PoE port power and power back up the PD. It will greatly enhance the network reliability through the PoE port resetting the PD’s power source and reduce administrator management burden. The GS-5220-48PL4XR allows each of the connected PoE IP cameras to reboot at a specific time each week. Therefore, it will reduce the chance of IP camera crash resulting from buffer overflow. 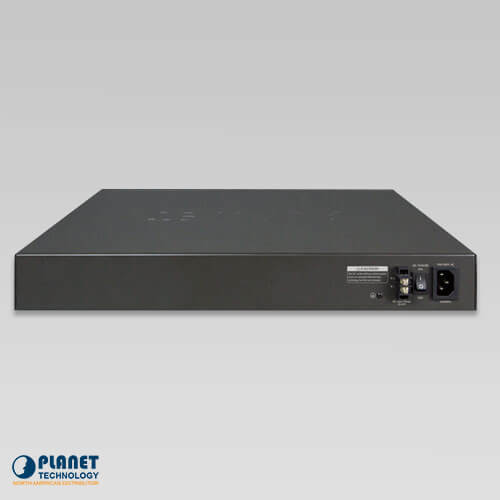 The GS-5220-48PL4XR is able to construct any PoE network including VoIP and wireless LAN. The GS-5220-48PL4XR is environmentally friendly and can effectively control the power supply while still providing high watts of power. The “PoE schedule” function helps you to enable or disable PoE power feeding for each PoE port during specified time intervals and it is a powerful function to help SMBs or enterprises save power and money. 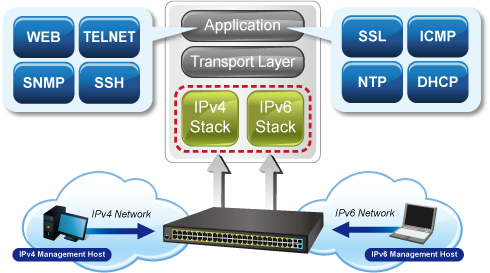 To help customers stay on top of their business, the GS-5220-48PL4XR not only offers ultra high transmission performance, but also IPv4/IPv6 VLAN routing feature which allows to cross over different VLAN groups and IP addresses for the purpose of having a highly-secure, flexible management. 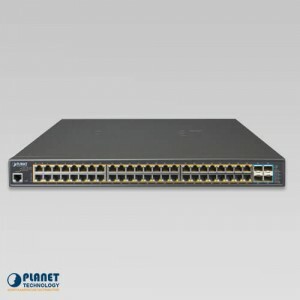 The GS-5220-48PL4XR can be programmed for advanced switch management functions such as dynamic port link aggregation, Q-in-Q VLAN, private VLAN, Multiple Spanning Tree Protocol (MSTP), Layer 2/4 QoS, bandwidth control and IGMP/MLD snooping. The GS-5220-48PL4XR provides 802.1Q tagged VLAN, and the maximum VLAN groups allowed is up to 256. Via aggregation of supporting ports, the GS-5220-48PL4XR allows the operation of a high-speed trunk combining multiple ports. The switch enables a maximum of up to 26 trunk groups with 4 ports for each trunk group and supports connection fail-over as well. The GS-5220-48PL4XR offers comprehensive Layer 2 to Layer 4 Access Control List (ACL) for enforcing security to the edge. It can be used to restrict network access by denying packets based on source and destination IP address, TCP/UDP ports or defined typical network application. Their protection mechanism also comprises 802.1x Port-based and MAC-based customer and device authentication. As to private VLAN function, communications between edge ports can be protected to ensure customer privacy. The GS-5220-48PL4XR also provide functions of DHCP snooping, IP source guard and dynamic ARP inspection so as to prevent IP from attacking and discarding ARP packets with invalid MAC address. The network administrators can now construct a highly-secure corporate network with considerably less time and effort than before. As the GS-5220-48PL4XR supports the IPv6 Protocol, they help SMBs and enterprises to step in the IPv6 era with the lowest investment, meaning the existing network facilities need not be replaced. For efficient management, the GS-5220-48PL4XR is equipped with console, Web and SNMP management interfaces. With the built-in Web-based management interface, the GS-5220-48PL4XR offers an easy-to-use, platform-independent management and configuration facility. The GS-5220-48PL4XR supports standard Simple Network Management Protocol (SNMP) and can be managed via any standard-based management software. For text-based management, the GS-5220-48PL4XR can be accessed via Telnet and the console port. The switch offers secure remote management by supporting SSH, SSL and SNMP v3 connection which encrypts the packet content at each session. More and more engineers and administrators use Cisco commands to manage their Ethernet switch. The GS-5220-48PL4XR offers Cisco-like commands to reduce customer learning time. With easy and friendly management interfaces, and plenty of management functions included, the GS-5220-48PL4XR is the best choice for ISPs to build the IPv6 FTTx edge service and for SMBs to connect with the IPv6 network. 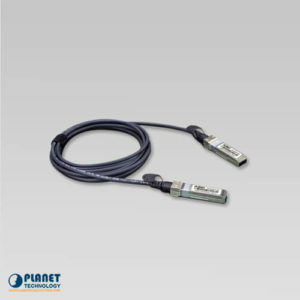 The GS-5220-48PL4XR supports SFP-DDM (Digital Diagnostic Monitor) function that greatly helps network administrators to easily monitor real-time parameters of the SFP, such as optical output power, optical input power, temperature, laser bias current, and transceiver supply voltage. 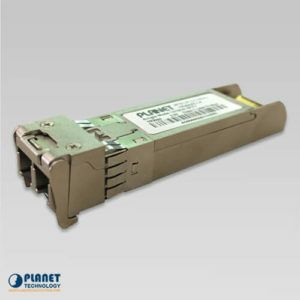 The MGB-LX by Planet Technology is an 1000Mbps Gigabit Ethernet SFP Fiber Transceiver. 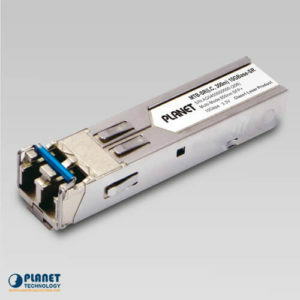 The MTB-SR by Planet Technology is an 10000Mbps 10G Ethernet XFP/SFP+ Fiber Transceiver. 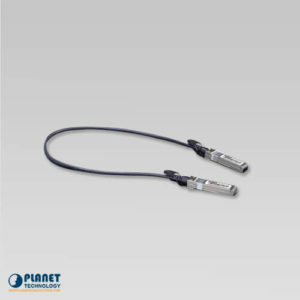 The MTB-LR by Planet Technology is an 10,000Mbps 10G Ethernet XFP/SFP+ Fiber Transceiver. PLANET’s GS-5220-48PL4X Layer 2+ Managed PoE Switch supports both IPv4 and IPv6 protocols, and hardware-based Layer 3 static routing capability.